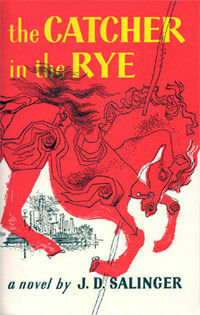 I recently finished reading this amazing book “Catcher in the Rye” by J.D Salinger. The book is a masterpiece. It is simplicity at its best. It is written in what is called a subjective style from the point of view of its main character, Holden Caulfield (ref:wiki). It is a narration of this teenage boy who struggles with his identity and like every teenager struggles to discover his true potential. The book is about this boy who represents the youth and portraits the struggle of a teenager to be accepted in the society especially when he is different from others yet not any less special than anyone else. There are times in the story where it reminds me of my own identity crisis and my own struggle with being able to relate to what is accepted in societal standards and what we really want to do. I can totally relate to Holden’s dissatisfaction of every school he attends. It reminds me how poor our education system is that judges us only on the basis of marks obtained rather than letting us explore our true capabilities. Although, I never really rebelled against the education system in my country, I can relate to the disciplinary systems mentioned in the book. Back at the time, I wasn’t smart enough to identify that getting good scores and doing the expected is not the only way of “being a good student/child” and I was not mature enough to differentiate that being ordinary in terms of scores and extra-ordinary in terms of imagination/creativity and mere silliness can also be considered as “being a good student/child”. The paragraph I stated especially made me proud that I read this book. When I first bought the book, I didn’t have any idea what the title meant and as I read the book, the title didn’t ring a bell either. But as the chapters unfolded, I came across this wonderful paragraph where the protagonist talks about what he wants to be and this was the wow moment in the book for me. Throughout the book, it is revealed that the protagonist is not doing well in his school and is a teenage rebel who struggles to be accepted in the society, struggles to make his family proud, loves his siblings and secretly admires a girl. The protagonist does very well in English, the only subject he likes and does good in. The book throws hints that the protagonist has an ability to become a good writer. And as the chapters unfold, it reveals the character of the protagonist to be gentle, kind hearted, family loving kid who wants to be accepted at his school by his friends and wants to appear cool but at the same time he cannot not be himself and not do things that he does, which leads to his dropout from every school he attends. It would have been expected and normal yet a good writing for the writer to talk about the protagonist in the way he revealed the story and end it like the way it did. But what made the book extraordinary and the writer a genius for me is the mention of this paragraph where he reveals an entire new aspect of the protagonist who aspires to become a good human being first and who wants to simply do good and not be noticed. The protagonist is not depicted as some troubled kid who struggles with the education system and wants to read and write literature but as a philanthropist who wants to do what he loves to do and live his dream. All in all, the book nails it in terms of simplicity and honest portrayal of the protagonist. I am very impressed by this particular paragraph and I wish all the kids of all generations to be encouraged by the society to let them do what they love to do. Why did I think I could write? Today, like most of the days, I am in a dreamy imaginative deep thinking avatar!! It usually happens when I have nothing interesting to do at work and the work that I have does not interest me. It forces me to think, how did I end up being where I am and why am I doing what I do? Now these two questions have knocked at my brain quite often and I have opened the doors to my ever resting intellectual chambers to take off few minutes off of the heavy tiring job of resting and get to work to answer these two questions that haunt my soul now and then. First of all, my brain didn’t know that I would need passion in the everyday work I do in order to satisfy the life in me. Had it known this simple fact of life, it would have taken me somewhere else or it could be that my brain has never been smart enough to actually know what I would be happy doing. May be it could never decipher what I truly wanted. So, this explains my relationship with my brain, its not a great relationship, but we are working on it, communicating more often to come in terms and find harmony among each other so that we could work towards the betterment of each other. Not to mention that I could be ignoring what my brain wants me to do and just cruising along with what “me” wants to do!! I would need a brain anyway to find the difference but nevertheless we will not disappoint each other do what we think is best for each other. Now lets get back to the title and lets talk about what made me think I could write. My earliest experience of writing outside of the academic curriculum is a reply to a love letter sent to my best friend. I was in grade 8 at that time. She got an elaborative love letter from a guy she had known and she wanted to reject him with style!! So there I was, borrowed by my friend to write a rejection letter with the then fashionable words of deep understanding and compassion towards his feelings. I do not remember the exact words I used (it would be funny to find that letter now :)), but i remember borrowing phrases and words from famous love songs of that time, how corky of me!! I know I used “I will never be able to love you Truly Madly Deeply! !”…i know its pathetic…so please indulge and laugh your brains out on it and I wouldn’t mind :). So, thats the first memory I have of writing something out of academics. After that, at grade 9, I remember rambling about life, its existence, our existence, the world and stuff like that in Nepali. It was all as a result of a fight with my best friend (the same friend for whom I wrote the letter). That fight with her, left me abandoned and alone in class, so I wondered about pain, suffering, loneliness and wrote down my rampant feelings on paper hoping that she would discover it one day and we’d be friends again. So, that year I started writing on my dairy on a daily basis, but it was not about the daily activities at school, rather it was about the extreme emotions I felt, nature, life and all its mysteries and miseries. Then the next year, when I was in my 10th, things worked out and we went back to being good friends again. And the writings slowed down as well. So my guess is, writing was my medium of venting out emotions. May be I found a loyal friend in a pen and a paper. When I graduated from school and went to another school( for +2), we had interesting course books on English literature. I was introduced to Anton Chekov, poems like “Lamentations of the old Prisoner” and some other literary pieces that I don’t exactly remember. Our English teacher was from India, Assam but he was a Nepali. He was very expressive and took his classes seriously. He encouraged us to be be creative and it was the only class I enjoyed in my +2 days. I never paid any attention to Physics, Mathematics and Chemistry that I studied (what a waste of time and money!!). So he gave us assignments that required us to be creative. One day, he called me in private and told me, “I reviewed your assignment and found that your writing is very simple yet creative, you should write more often and polish your skill”. I was pleasantly surprised that day, I don’t know what his intentions were or if he did actually find my writings fascinating but for me, it opened a door to an unknown world. I was in bliss to discover something I enjoyed doing was worthy enough to be encouraged to pursue it further. After that, we had long conservations about books, styles of writings and general day to day emotions. We became friends and he shared some of his writings with me, I was fascinated by the way he wrote, the way he talked about emotions and sentiments in his writings. I still draw inspiration from the early essays that my teacher shared with me. Then one day, he invited us for a cup of coffee(me and another friend of mine) and told us a story. I will never forget how he narrated the story that day, it was amazing, it was full of expression, feelings and emotions. At the beginning, I thought it was funny but I got engrossed in this story. At the end of that story telling session, he told me that, “I want you to write this story down!!”. I will never ever forget that moment. I felt so honored and special that day, like I had something in me and I was chosen by my teacher to write a story that was so special and dear to him. This made me think that may be I could write. May be there is something special in me. I would like to thank my teacher for showing me the way, believing in me and encouraging me. Then, my +2 days were over but I had it at the back of my mind that I would write this story down. After that, I joined Engineering and was busy with my studies but never fascinated by what I studied at school. I thought it was my duty to study and get descent grades but it never occurred to me that passion was essential to pursue it every single for the rest of my life!! When I was in second year, I wrote down that story. I had already forgotten the details, I was a fool to not write it down the evening he narrated that story to me. I was too ignorant to know that such an experience would be worth preserving. After I finished writing it, I typed it and emailed it to my teacher. And being the teacher that he was, he reviewed it, made some corrections, mentioned some suggestions and told me it was not as good as he expected it to be. But for me, I knew, the journey had began. I knew I would write, whether it would be worth reading or worth sharing, I knew I would be writing. The same year, I submitted it to one of the online magazines operated by Nepalese living abroad, so my story was up somewhere for people to read. After six months, I submitted it to “The Himalayan Times” and it got published in the Midway section. It was the first time I saw my name in print and it was such a warm feeling. I informed my teacher about my publication, he congratulated me and told me it could have been better. From then on, I have written now and then. I did not submit any of my other writings to the newspaper again, may be I was scared of being disappointed, scared of knowing and it was a one time thing. Writing makes me feel good, I feel at peace when I write something down. I like to express myself through words. I know I don’t have that fire burning as bright as it used to, it has faded with time, I should have taken it more seriously. But nevertheless, its never too late to do something that you love doing and my love for writing has brought me here, to this space in clouds, at meromusings.wordpress.com and I intend to be loyal to it and write, as writing is my first love and I will always be loyal to writing and love it unconditionally.